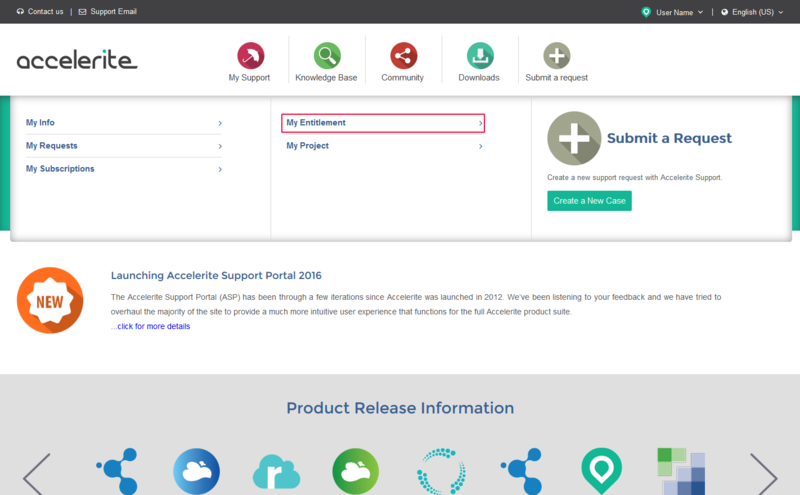 The Accelerite Support Portal provides a synopsis of the organization support and license entitlement history. A user can only see entitlement information for the organization they belong to. Currently this utility is only available for the Radia product, Accelerite will be rolling out this functionality to all products in the future. 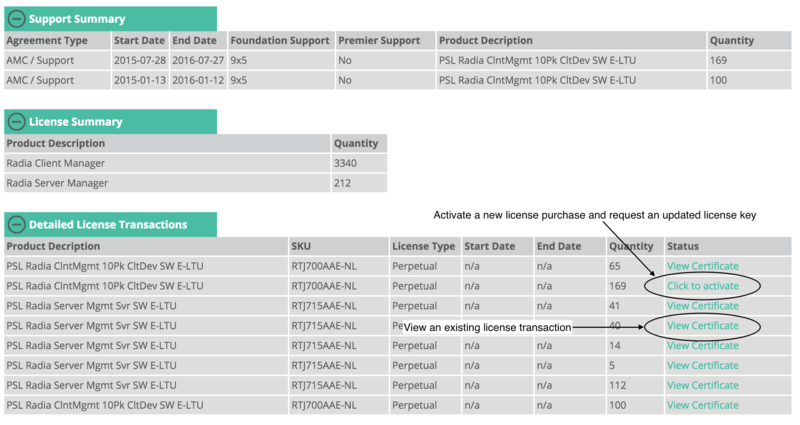 A short synopsis of the organization license information using friendly names for each of the Radia modules. A summary of the support agreement transactions with start and support agreement expiration date. A detailed transaction history with quantities purchased along with information pertaining to the transaction. There are two actions that can be completed with the detailed transaction history. View the entitlement certificate for a completed license purchase. Activate a new license purchase. Viewing an existing certificate is straightforward. Simply click on the 'View Certificate' link on the transaction line item. The certificate will be viewable within the browser and a PDF copy can be downloaded. License activation is required in order to complete a license purchase. The process is easy to follow and only needs to be completed by one representative of your organization for each license purchase. Click on the 'Click to activate' link for a particular transaction that has not been previously activated. An overlay screen will appear and request that the End User License Agreement (EULA) is accepted. Simply check the accept radio button and click 'Submit & Download'. The proof of entitlement certificate will then be generated. This certificate will be downloaded and viewable in the browser window. New licenses will require an updated license key, the activation process will generate a customer support request to provide an updated license file which will be delivered through email and the newly generated customer support request. On delivery of the new license an Accelerite Support Representative will close the customer support request. As always, if you have any problems with any of the information in this article please contact Accelerite Support.